The recent scandal from pork DNA being found in Halal certified food involving a Northern Ireland manufacturer (McColgan Quality Foods), a UK distributor (3663) and a Halal certification agency (Halal Food Authority)…not forgetting the Ministry of Justice and various prison inmates…actually highlights an opportunity. To cut straight to the chase, this kind of incident was just waiting to happen. And is still waiting to happen again anywhere in the Western world, and indeed anywhere in the Muslim world that imports food from the West. However, it is highly unlikely that such an incident could have happened in Australia or New Zealand. Why? Because the authorities in those countries have recognised the importance of the Halal food market to their national economy, and have taken steps – and some pretty long hard ones at that – to ensure that the integrity of their Halal supply chain is intact. In the UK, Europe and the USA, just about anyone who felt so inclined could set up shop as a Halal Certification body, given some degree of recognition from the local Muslim community. There are no criteria for definitions, standards, SOP’s, auditing procedures, and no way to protect against conflicts of interest. It is still the wild west frontier of the food industry. There is no Accreditation body that oversees the competence, professionalism or integrity of the certifiers. They are not accountable to any higher authority in any realistic way. Some will certify a process involving mechanical slaughter and recordings of the Bismillah without site visits, and with little regard for what might have happened on that line the day before. Others will insist on non-stunned hand slaughter, with the animal facing Makkah…and claim all other procedures to be Haram. And while these two ideological positions fight it out, often with less regard to following the consensus of scholarly judgment than to sniping at each other in the press…oops, pork DNA appears in the pasty. In contrast, Australia has, over the past decade, worked hard to create a structure whereby, under government supervision, the producers, manufacturers, and the health, safety and veterinary agencies work with recognised and approved Islamic bodies to ensure that Halal actually does what is says on the tin. 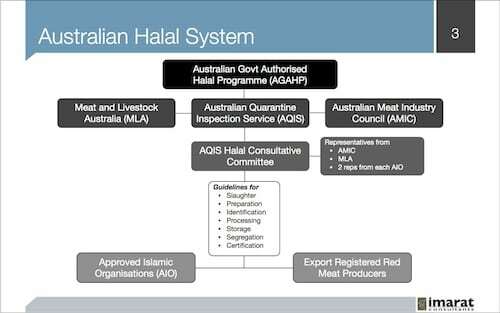 The Australian Government Authorised Halal Programme (AGAHP) is not rocket science. It is simply the application in the Halal food arena of the same procedures that exists in the rest of the food industry. It is a similar process to the way standards such as HACCP, GMP and ISO are audited. This means that if you are not an approved Halal certifier, working within the parameters of the AGAHP, you cannot issue Halal certificates. The result is a workable system that effectively ensures the integrity of their Halal supply chain. It also earns them hundreds of millions of export dollars. This is essentially a religious issue, that is to say the parameters for Halal compliance come under Islamic law. But it is also de facto an economic issue. With the majority of the Muslim world importing food from non-Muslim countries, there is an opportunity to become a trusted supplier of Halal food. In order for this to happen, the authorities in the UK need to firstly wake up and smell the opportunity, and then follow the example of Australia and set up a workable system to ensure the integrity of the Halal foods produced in the UK. Muslim consumers will be able to have confidence in our Halal produce, manufacturers will avoid embarrassing and costly mistakes, and a UK Halal export industry can be developed, bringing some welcome relief to our farmers. It is not complicated; quite the opposite. It has already been done.